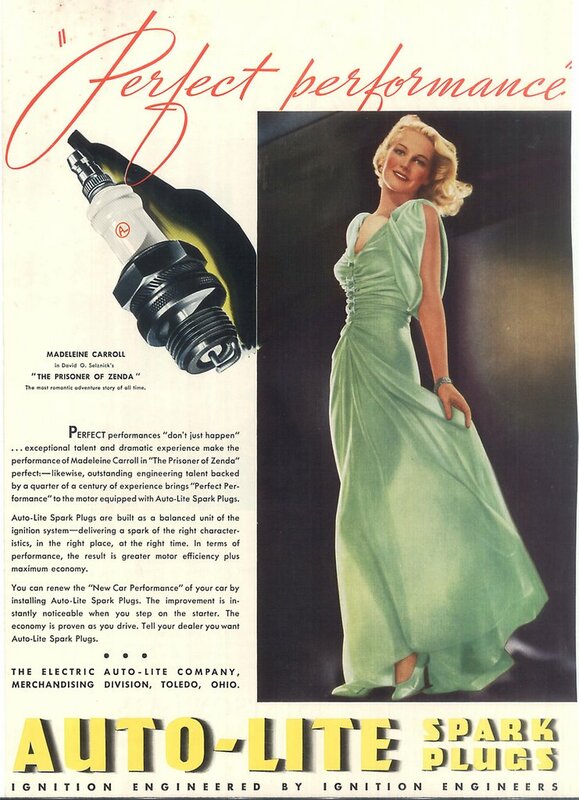 I don’t know what Madeleine Carroll has to do with spark plugs, and I wonder if she would have appreciated being linked with them here, since chances are she never had occasion to change one, and probably understood neither their function or application. The tie-in was for her latest Selznick-International release, The Prisoner Of Zenda. That would make it 1937. The Auto-Lite people must have rightly assumed that a full-length color portrait of Madeleine would be more arresting to readers than the mere facsimile of an otherwise undistinguished spark plug. Stars were put forth to sell everything in those days. I never see celebrity endorsements anymore. I understand big names peddle all sorts of product in Japan, but nothing stateside. Is this a lost art? I've also read a lot of major stars are still doing ads (both print and tv) in Europe. Apparently it's considered too crass to be seen hawking wares in the US. Autolite would of course sponsor Suspense for several years in the late 40s/early 50s, bringing many major Hollywood stars to the Columbia mic. "You're always right with Autolite!" We see so much product placement in movies today, it is clear business and the movies know the value of finding ways to motivate consumers to buy various products. However, the connection of “celebrities” to products in ads is not what it was, and the reasons for this are worthy of study especially with what we see done in the USA compared to Europe and Japan. Is it because Americans are less influenced by celebrity endorsements? Then why do so many celebrities share their political and social convictions so freely? Were movie star endorsements of detergents, cigarettes, and spark plugs in the past as well reasoned as some of today’s stars shared convictions to free convicted murderers, stop global warming, and justify the actions of terrorists? Of course, some celebrities step up advertising to a much greater degree, with infomercials and home shopping network ads on diets, exercise equipment, fashion and jewelry not thought of in the past. But your point remains for what is done for the markets in Japan and Europe compared to what is done in the USA. I would hazard a guess that the celebrities saw none of the money for these endorsements in the 30's and 40's, it was probably just part of the expected publicity that the studios put them through.